Why choose Addison Ridge? Our unique, exclusive design and upscale amenities offer an unrivaled experience for Fayetteville residents. Our apartment community is in a great location, convenient to all of your favorite attractions, shopping and recreation activities in Fayetteville, NC. Our leasing options are great for anyone looking for luxury housing in the Fayetteville area. Whether you need temporary accommodations for three months or are looking for a more permanent residence, you can find what you need at Addison Ridge. We offer one, two and three-bedroom apartments for leasing. 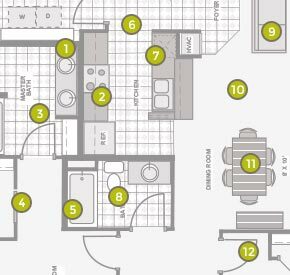 All of our apartments feature 9’ ceilings with oversized “window walls”, a GE 25 cycle fridge, granite countertops, double vanity sinks, plush carpet, washer/dryer hookups and a balcony. When you walk around our community, you will find a wide array of amenities that can entertain your friends. From an expansive fitness center to a beautifully-designed swimming pool to a movie theatre, there is something for everyone at Addison Ridge. Come and see why Fayetteville residents are choosing Addison Ridge for their next home. Contact us at (910) 226-2455 to schedule a tour of our facility. Addison Ridge proudly provides modern housing to customers in Fayetteville. We are also convenient to Fort Bragg, Hope Mills, Pope Air Force Base and surrounding areas in NC.